We again stumbled upon another convertible device from Lenovo’s Yoga lineup and again representing the budget-class laptops. Nonetheless, the Yoga 500 notebook comes with a wide variety of hardware and as the price goes up, so does the performance and the screen. In this review, though, we are going to focus on the basic model that offers the bare minimum at this price range. There are some things that we can’t get pass by despite the price tag, but it sure does offer a lot of flexibility, good design, and features. 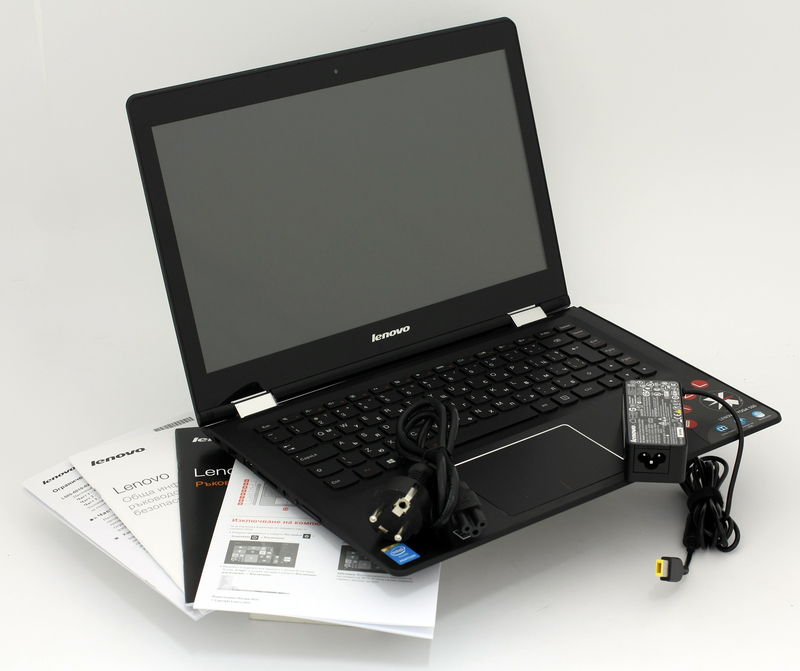 For a little over €500, you can get a fully functional convertible with several key selling points that Lenovo should have made an effort to explain more thoroughly about them. This is because the new Lenovo Yoga 500 lineup kind of aligns with the Yoga 2-13 series, or at least some of the models are much alike. Both families feature a 360-degree hinge and mostly similar hardware, but if you are in a need of a slightly bigger screen size (14″) and the option of a discrete GPU, the Lenovo Yoga 500 should be your choice. 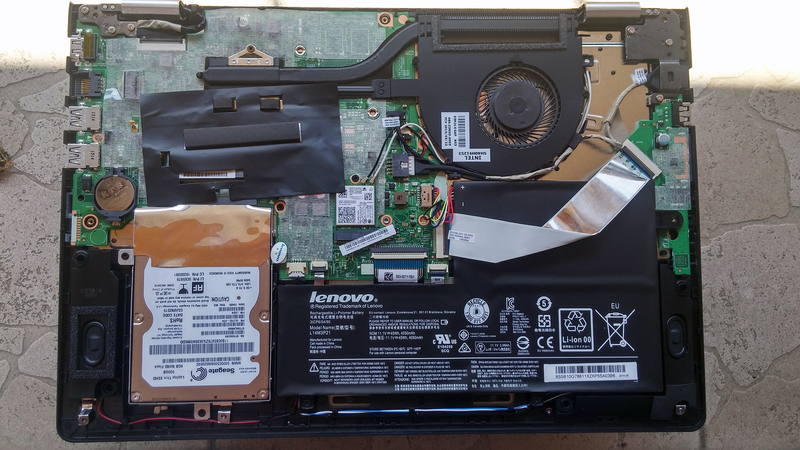 The Lenovo Yoga 500 comes in a standard package containing all the usual user manuals, AC adapter and cable for charging, and DVD with drivers if you wish to perform a clean install of the system. However, we recommend downloading all the needed drivers from the website. The design of the notebook is definitely not bad even though only plastic is used for the build. It’s kind of lightweight, sturdy and relatively thin, but maybe not light and thin enough for comfortable use in tablet mode. 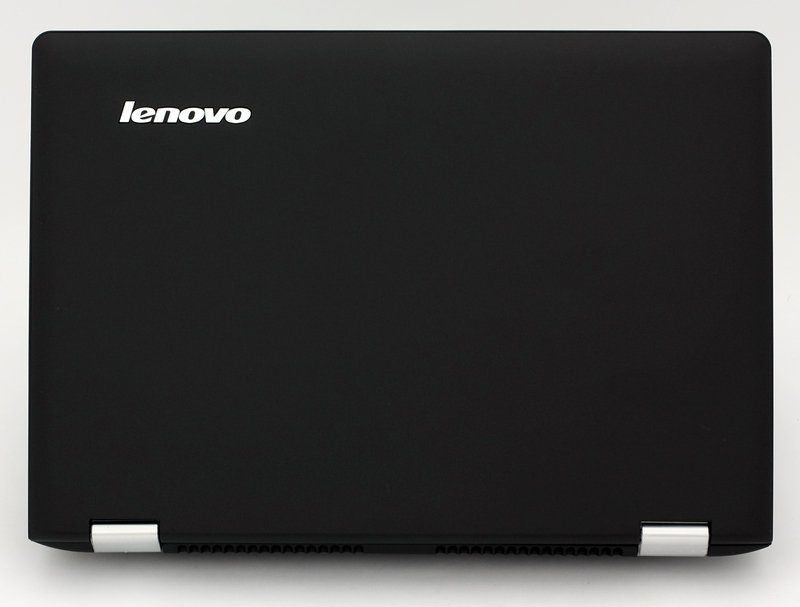 The lid is covered in matte hard plastic with only Lenovo’s logo in one of the corners and the hinges standing out. Speaking of the hinges, they seem to be overtightened when opening the lid (both hands are needed), but at the same time the wobbling effect when using the touchscreen is very distinguishable. Furthermore, the matte plastic on top doesn’t attract fingerprints and smudges so easily, or they aren’t so visible, but dust builds up quite a lot. Frequent cleaning will do the job, though. On the other side of the lid is the 14-inch HD touchscreen with fairly thin bezels and the webcam on the top one. 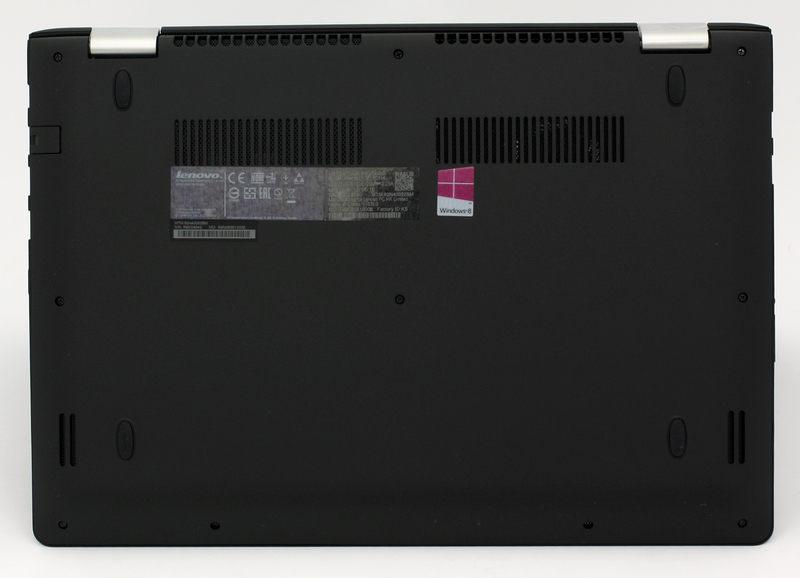 The bottom side of the notebook has the very same matte finish, but few vents for extra airflow, the main holes for dispersing the heat between the hinges and the loudspeakers located on the sides. For a convertible, Yoga 500 isn’t one of the thinnest offerings out there, but having in mind the price, we can let that one pass. But keep in mind that the profile’s height doesn’t change as the price goes up, so probably the much pricier version will not satisfy in terms of mobility. Still a 23 mm height isn’t all that bad. The left side accommodates the DC charging port, one USB 2.0, an SD card reader, 3.5 mm audio jack and the volume rocker for easier access in tablet and tent modes. 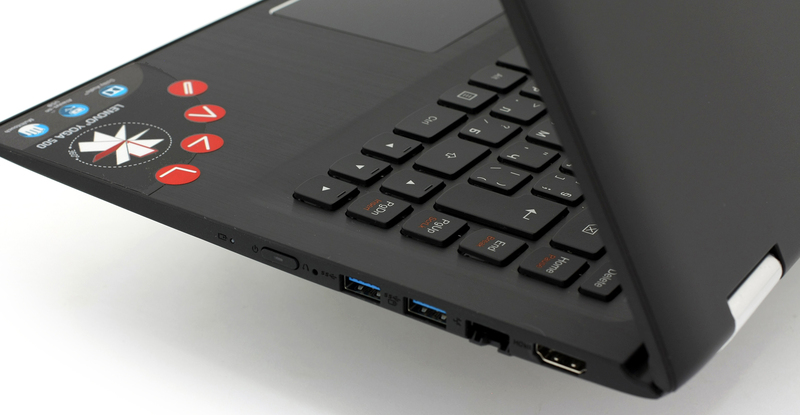 The right side contains the HDMI, LAN, two USB 3.0 ports and the power button. Interestingly, the interior is much different from the outer chassis – it features brushed aluminum finish with great tactile feeling, but it attracts greasy smudges and fingerprints. The keyboard sinks under pressure, but nothing so serious to be categorized as a major issue. Keyboards on such devices are mostly good and the this is exactly the case here – the AccuType keyboard performs well with long key travel, yet nothing too special about it. 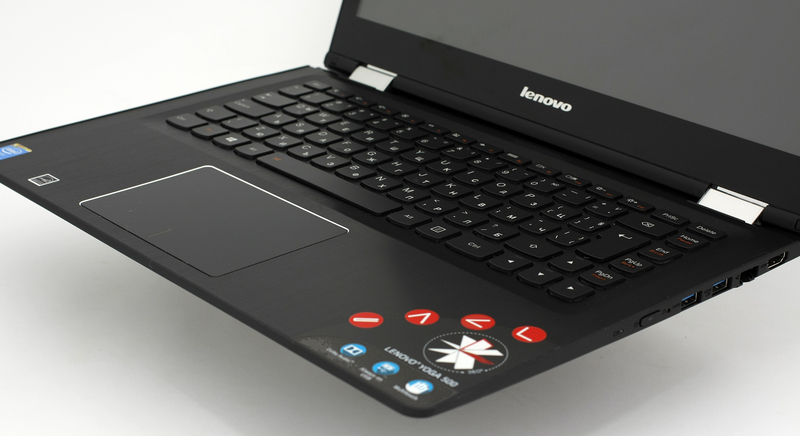 It kind of reminds us of the keyboard used Lenovo Y50 and other notebooks we’ve tested from the company. 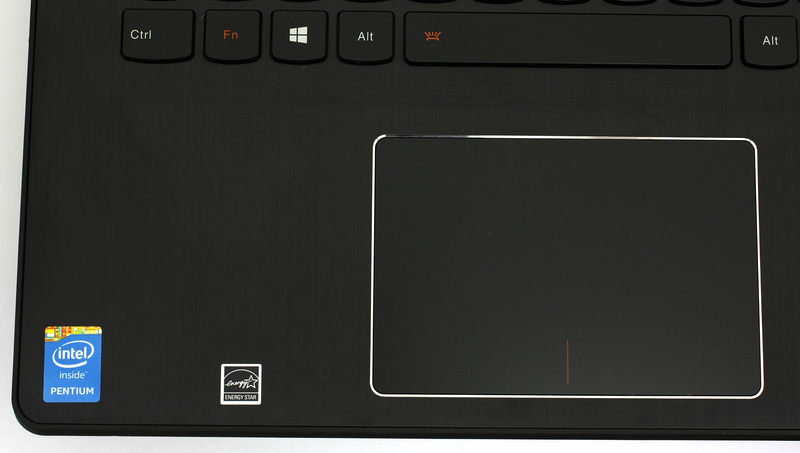 The touchpad, on the other hand, wasn’t what we’ve expected. It’s still big for a 14-inch notebook, that’s definitely a plus, but it wobbles at times and it isn’t as responsive. Sometimes left and right clicks are incorrectly registered too. To sum things up, the notebook feels great in hand with rigid construction and silicone edges around the screen and the base for additional stability in tent mode. The latter, however, adds an interesting and somehow awkward edge when used in tablet mode and feels a bit thick. In addition, the screen wobbles most of the time when using the touchscreen. But since it’s going to be used mainly for traveling around without sacrificing the full functionality of a standard notebook, the Lenovo Yoga 500 delivers with ease. The low weight is also here to vouch for that claim – only 1.8 kg. 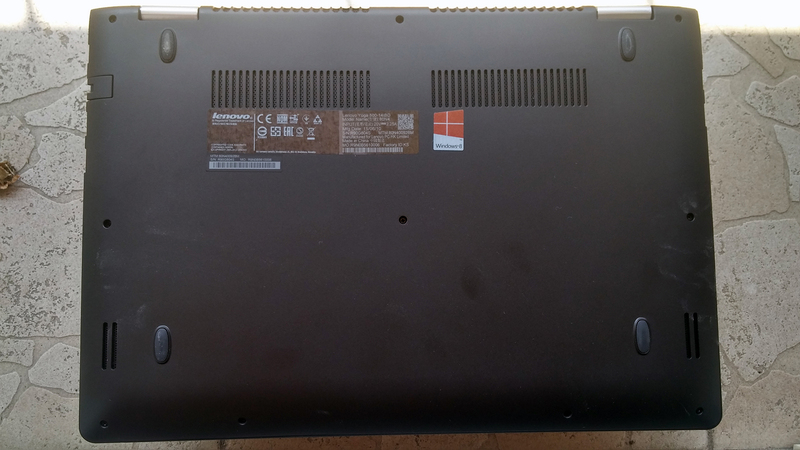 Lenovo Yoga 500 uses TN touch panel with model number N140BGE-EA3. It measures 14″ packing a resolution of 1366 x 768 with 16:9 aspect ratio resulting in 112 ppi pixel density. The screen can be considered as retina when viewed from a distance equal or greater than 79 cm. On the microscopic photo below you can see the Anti-Glare coating, under the first glass layer, used for diffusing the light output. Due to the TN panel used for this model, viewing angles aren’t satisfying, Here’s how the image quality looks under 45-degree viewing angle. The maximum brightness is just 185 cd/m2 with a deviation equal to 11%. The average color temperatures measured on the surface is 7060K – a bit colder than the optimal one of 6500K. The yellow triangle on the image below represents the color space that the current display covers. 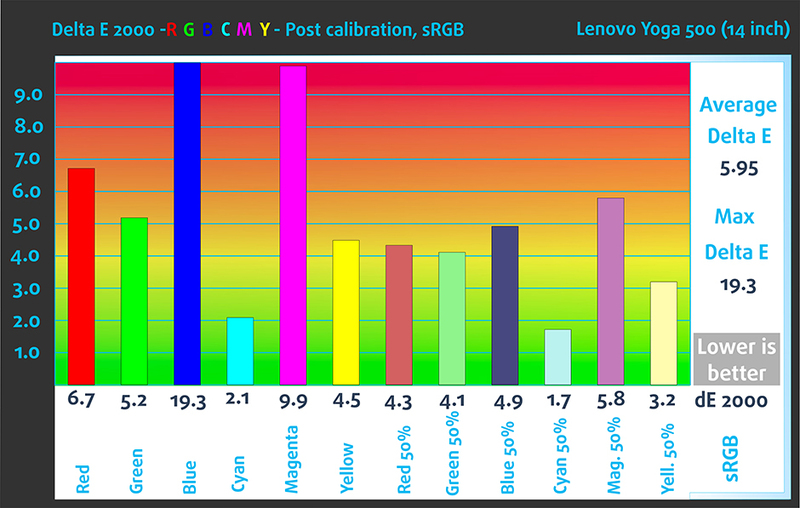 Lenovo Yoga 500’s screen is capable of reproducing just 56% of the sRGB color gamut and 48% of the Adobe RGB. X-Rite i1Display Pro was used for a hardware calibrator. With the help of 24 commonly used colors, we checked the color accuracy of the panel. Colors that we used represent skin tone, grass, blue sky, orange and etc. 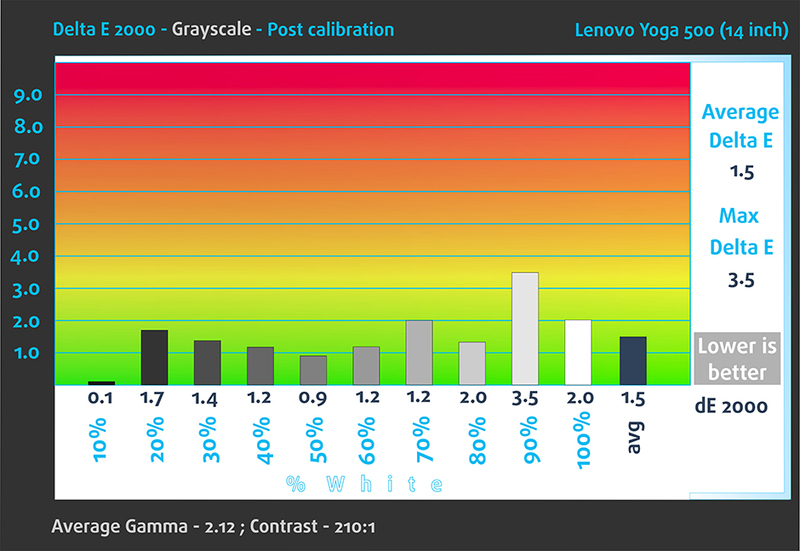 The average DeltaE 2000 is 1.72 after calibration. Lower score is desirable and deviations under 1.0 can be detected only with a lab equipment. Unfortunately this panel uses PWM across all brightness levels, except at 100% screen brightness, and frequency of the emitted light is 220 Hz which doesn’t help reducing the eye strain at all. The panel inherits all the bad and good sides of a typical TN matrix. IT consumes a lot less power than the average IPS panel, but lacks the viewing angles, sRGB color gamut coverage, high brightness, and contrast ratio. It also uses PWM across all brightness levels at a really low frequency – 220 Hz which puts a lot of strain on the user’s eyes, especially when they are sensitive. 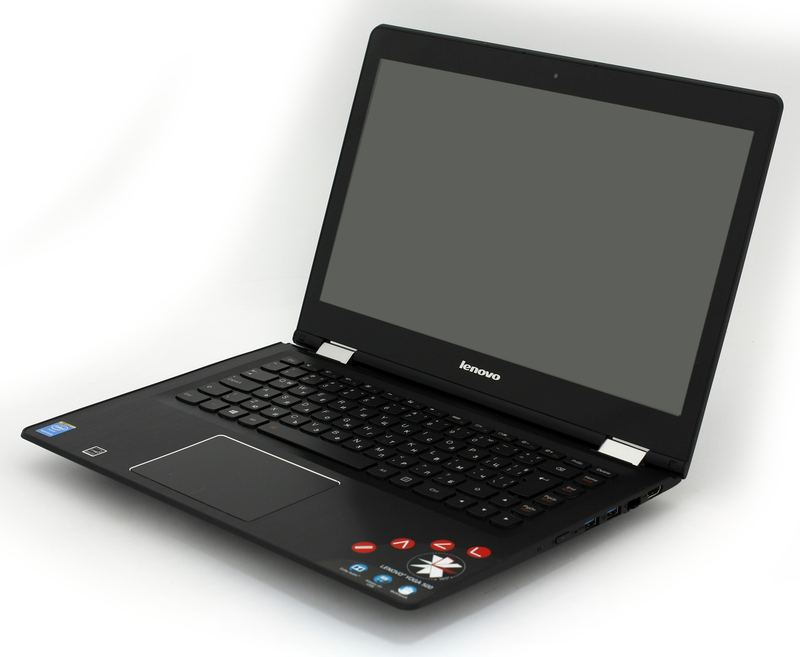 The loudspeakers provided here – Dolby Home Theater and Dolby Digital Plus technologies help improve the sound quality of the notebook in various modes like gaming, watching a movie, listening to music etc. The sound is definitely of high quality. А rather big battery we’ve got here. 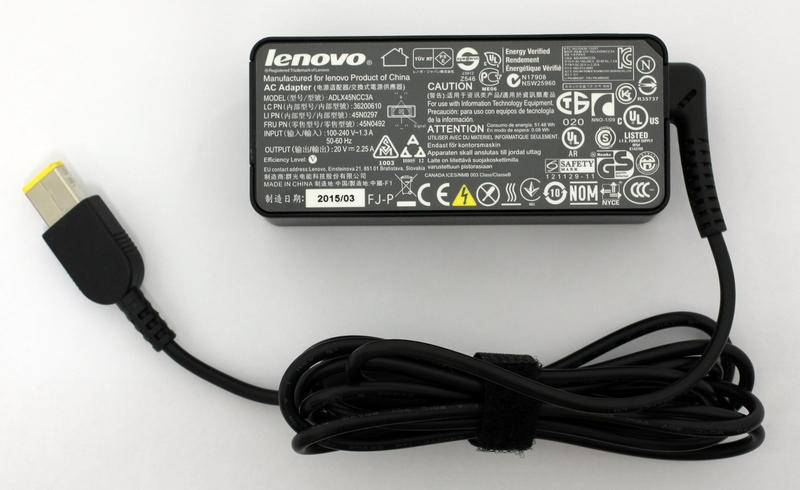 Rated at 45Wh, 4050 mAh, 3-cell and paired with energy efficient hardware like the Intel Pentium 3805U and low-resolution TN panel, we expect good battery performance. We ran the usual tests like Wi-Fi browsing, video playback and gaming sharing the same setup – Wi-Fi turned on, screen brightness set to 120 cd/m2 and power saver is on. Slightly below average result on the web browsing test – 288 minutes (4 hours and 2 minutes). Similar result, but a tad lower – 250 minutes (4 hours and 18 minutes). Fritz is a chess benchmark that tests the computing capabilities of the CPU with various chess moves. The Intel Pentium 3805U managed to get 3.096 million moves per second. For comparison, one of the most powerful PCs, Deep(er) Blue, was able to squeeze out 200 million moves per second. In 1997 Deep(er) Blue even beat the famous Garry Kasparov with 3.5 to 2.5. The Intel HD Graphics (Broadwell) is an integrated graphics chip paired with most of the entry-level Intel CPUs and it’s based on the Gen 8 graphics that offers better performance-per-clock than the previous Intel HG Graphics (Haswell). For comparison, the Haswell GPUs include 10 EUs (Execution Units) while the new Gen 8 graphics core boasts 12 EUs clocked at 100 – 800 MHz. Some of the supported features are DirectX 11.2, OpenCL 1.3/2.0 and OpenGL 4.3. For video output, the GPU supports DisplayPort 1.2 and HDMI 1.4a, but the HDMI 2.0 is nowhere to be mentioned. The GPUs performance should be marginally better than the Haswell GPUs and should handle most applications without any problems, but gaming on it will be almost impossible. With this test, we don’t aim to represent real life situation or usage, since it’s pretty hard for a normal user to achieve 100% CPU and GPU load under normal circumstances. However, the stress tests that we run are a good indicator how the cooling system handles bigger temperatures and how the system holds under heavy load. We start off with 100% CPU load for at least an hour, but since the CPU is rated only at 15W TDP and the clocks aren’t high (only 1.9 GHz without Turbo Boost), the silicon remained cool during the whole first part of the test. At normal state, the CPU was running at 35 °C and at 100% load it reached 53 °C. Still far away from the maximum operating temperature of 100 °C. Furthermore, we didn’t notice any throttling at all as the CPU was running at 1.9 GHz. It’s important to note that during the CPU stress test, the fan inside was spinning really quietly. We could barely hear it and we were left with the impression of using a fanless notebook. But the same cannot be said when we turned on the GPU stress test too. We started hearing the fan spinning, but it was at least doing its job pretty well – the CPU’s temperatures rose by a little (60 °C) and the silicon’s frequency remained 1.9 GHz. That’s quite impressive as most of the notebooks we’ve tested so far had excessive throttling when the CPU and the iGPU are put to the torture test. Keeping the temperatures on the outside low is just as important as keeping the internals cool. When the user interacts with the notebook, especially during prolonged usage, the notebook tends to get hotter on the exterior. That’s why we measure the temperatures to see if the internals affect the user experience. And as you can see from the heat map below, everything looks fine and dandy. The Lenovo Yoga 500 offers the bare minimum a notebook from this class can offer, spec-wise that is. We are presented with ULV CPU from Intel (Pentium 3805U), integrated graphics, and budget TN touch panel that didn’t do too well in our tests. Moreover, the battery life isn’t impressive either. We stumbled upon some issues with the build quality as well and we are referring to the touchpad and the wobbling effect of the screen. However, we cannot ignore the fact that Lenovo has included some things to the specs sheet that don’t come up so often in the current price range. In fact, it’s virtually impossible to find a convertible at this price. We’ve got a 360-degree rotating hinge, paired with rigid and light (1.8 kg) chassis suitable for traveling around. The touchscreen is also a plus if you are really fond of the tent and tablet mode. Yet, the keyboard is another interesting addition to the pros with LED backlight and relatively comfortable, long-travel keys. We were happy with the SSHD’s performance as it does offer an improvement over a standard HDD, which will most likely be seen in a standard configuration at this price range. 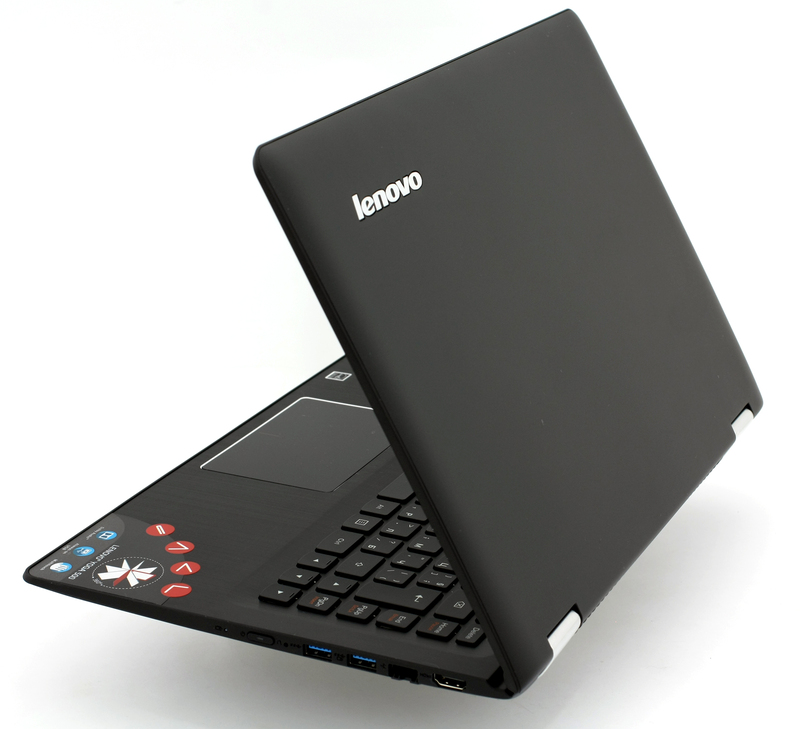 Basically, Lenovo is offering a sturdy convertible with cool features that aren’t supposed to be in this price range in the first place but raises concerns about the overall performance and durability of the pricier configurations. They do offer more powerful CPUs and a better IPS touch panel, but other things such as the touchpad and screen wobbling might be getting in the way. And our final words are about the cooling system, which scored pretty well in our tests because it kept the internals and the outer chassis cool during the tests and even the CPU didn’t throttle. This and the super silent fan came by a surprise. 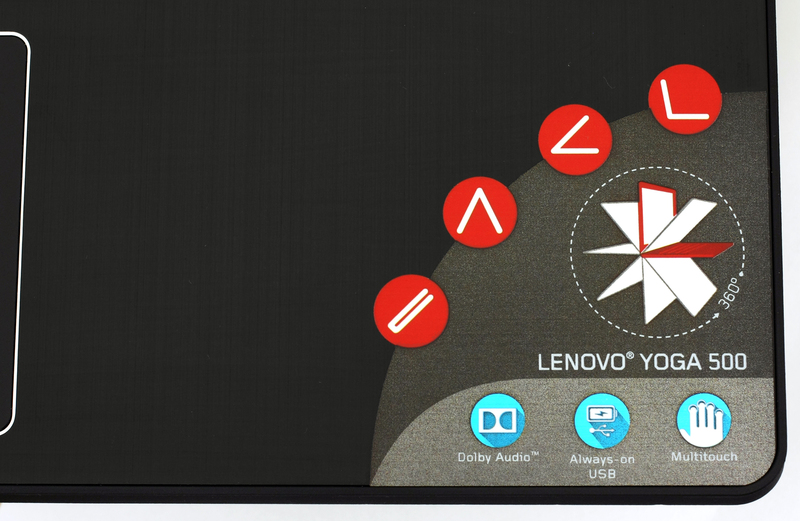 But lenovo yoga 500 is a FULL HD display right at 1920×1080? There are several versions available. The one we tested was with 1366×768 resolution with TN panel. Look at our “”Specs sheet” section. Thanks. this is really helpful ‘cz i’m planning to buy one. but i guess i would have to give a lot of thought about it thuogh the pice is reasonable. 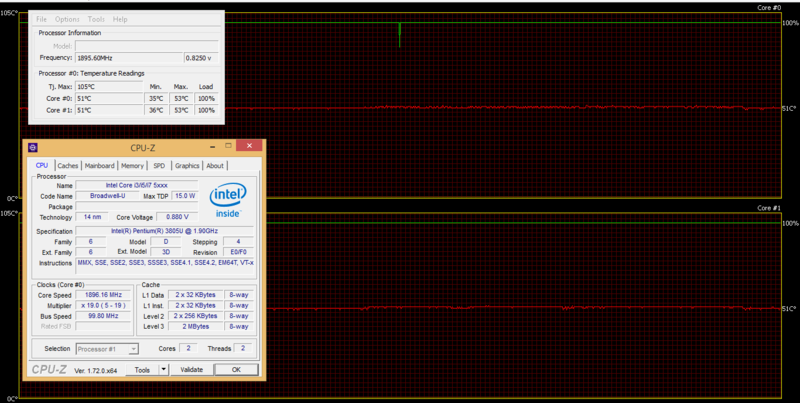 On 30% battery this (and other) models cap the CPU to 0.48 ghz. So far I have no found a solution around this. 0.48 ghz is not fast enough to do much of anything, so at 30% battery, your basically have a torch. Is this laptop good to play games such as call of duty?